It is my great pleasure to join you this afternoon at the commencement of this International Conference for Peace and Nation Building, which I understand is a joint effort between Jama’atu Izalatil Bid’a Wa Iqamatis Sunna based here in Nigeria, and the Muslim World League. 2. I would like to welcome you all; especially those of you who took the time to travel from different parts of the world to attend this very important conference. In particular I would like to extend a warm welcome to His Eminence, Professor Abdullahi bin Abdulmohsin Al- Turki, the Executive Secretary of the Muslim World League. c. To contribute to the global fight against terrorism because security is a shared responsibility. d. To attract global attention to the plight of those most affected by the insurgency which is mostly concentrated in the North Eastern part of our country. These include Internally Displaced Persons (IDPs), orphaned children, widows and the elderly who have been rendered homeless and helpless as a result of the insurgency. 4. 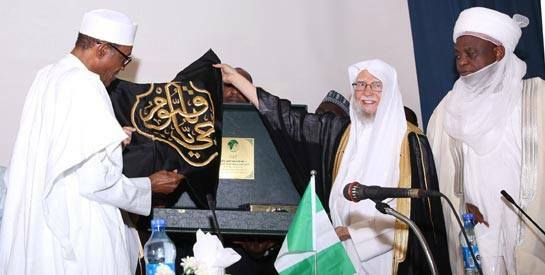 I wish to commend the organizers JIBWIS Nigeria and the Muslim World League, for this initiative. By making the Conference multi-religious and multi- sectoral, you have broadened the scope of the discourses that the conference will generate and thus have enriched the ultimate gains that will accrue from this laudable initiative. I urge you to solidify and sustain this working relationship encompassing all Nigerians and our neighbours, irrespective of religion or tribe for the benefit of mankind. 5. In my inauguration address on 29th May 2015, I mentioned that Boko Haram is a mindless, godless group who are as far away from Islam as one can think of. I assured Nigerians that at the end of the hostilities when the group is subdued the Government would commission a sociological study to determine the origin, the remote and immediate causes of the movement, its sponsors, its international connections if any, to ensure that measures are taken to prevent a recurrence of this evil. The outcome of the proceedings of this conference will be useful in that regard. 6. As we have had cause to mention earlier, our government in joint cooperation with our neighbours, has substantially degraded the attacking capability of the insurgents to a level that has now compelled the insurgents to retreat. We will pursue them relentlessly until they become an item of history. 7. The tragic paradox of the global insurgency situation is that most of the atrocities committed by various insurgents all over the world today, are being carried out mainly by people who pretend to be Muslims, yet most of the victims and casualties are equally Muslims. To underscore their cruelty and godlessness, they particularly target the most vulnerable members of the society: children, women and the elderly. No religion approves of such heinous crimes against humanity; definitely not Islam nor Christianity, the two to which most Nigerians belong. 8. This is a tragedy which all normal people must rise up against. Islam does not permit lawlessness. It frowns at extremism even in normal acts of worship. The emergence of any group advocating the contrary is therefore irreligious and unacceptable. Religious leaders must intensify their efforts to send out the real teachings of their religion in order to counter the diabolical ideology that motivates the insurgent elements. 9. I wish to use this forum to call on all religious, community and political leaders to mobilize their followers against corruption and crimes of any kind. They should also encourage them to be more tolerant of each other; and recognize the rights of others as they want others to recognize their rights to worship and live freely. 10. Our country Nigeria has suffered many years of official neglect and corruption leading to untold hardships to the common man. I wish to assure you that our government will do everything possible to safeguard lives and property and also to ensure even development across the country. 11. The global economic challenges the world is grappling with today might well turn out to be a blessing for us in Nigeria, because it will stimulate the latent economic opportunities that we have left untapped for decades. Poverty breeds disaffection, which in turn leads to crime and lawlessness including confrontation against the State. To checkmate this, we must work hard to lift our economy, engage our youth and rebuild infrastructure. We can only achieve these with full cooperation of all Nigerians and under a stable polity. We are determined to do this and we shall not be deterred. 12. As I declare this timely conference open, I wish you all the blessings of God and successful deliberations.